Honor's Addictions: Exciting News at Mad for Markers ! Exciting News at Mad for Markers ! Today I have some exciting news to share with you all. 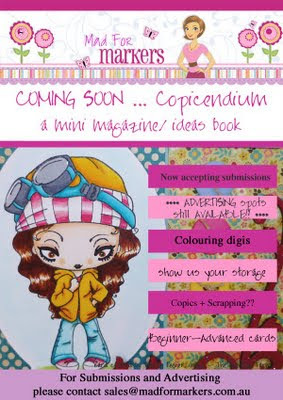 Over at Mad for Markers, Sammi has just announced she is releasing a mini magazine called "Copicendium"! Isn't this awesome !!!! This mini magazine / ideas book will include a variety of projects, tutorials, and many other ideas, specifically related to using Copics. It is anticipated the release of Copicendium will be late June 2011, therefore Sammi is on the hunt for submissions and advertising NOW. If this interests you, make sure you pop over to the M4M blog to read all the details on this. Picked just for you ! !